Considering an attic sealing project? Air sealing in the attic is generally a challenging DIY project, but the benefits can be substantial. If you are doing a major home renovation project, now may be a great time to tackle this project too. The good news is that, even if you're not comfortable taking on this project yourself, there are many qualified contractors who can help you get the work done. EPA recommends that you complete the attic insulation project after this project. Use the information below to determine if this project is a good fit for your home, what common problems it can help address, what the potential benefits are, what tools and materials you'll need to complete the project if you choose to do it yourself, important safety considerations, step-by-step instructions for getting the job done and when to seek professional help. Does my home need this project? You might also consider hiring a home energy professional to perform a comprehensive energy audit to pinpoint specific solutions for your home and identify potential safety hazards. Many local utilities may offer rebates for a professional home energy assessment and certain home air sealing and insulation projects. Be sure to contact your utility company before beginning a project to see what incentives are available in your area. You can also check for incentives using the DSIRE database for state incentives. 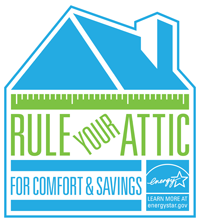 The attic is usually where you can find some of the largest opportunities to save energy in your home. By air sealing in your attic, you can stop many major air leaks and help to maintain the desired temperature throughout your home. Combined with attic insulation, air sealing can help to alleviate the formation of dangerous ice dams in the winter. Should I do the project myself or hire a contractor? If your attic is accessible and not too difficult to move around in, and you enjoy tackling bigger home improvement projects, attic air sealing may be a good DIY project. Otherwise, consider finding a contractor to complete the project for you. You may be eligible for financial assistance to make improvements like air sealing and insulating through your state's Weatherization Assistance Program (WAP). For more information, visit the following site and select your state of residence: Weatherization Assistance Agency Locator. Gather all your tools and supplies before you begin to minimize trips into and out of the attic. Be sure that the work area is well lit by using a drop light, and keep a flashlight handy. During hot weather, start working early, as attics heat up as the day goes on. Wear a lightweight disposable coverall, gloves and hat to keep itchy and irritating insulation off your skin. Wear kneepads for attics that require crawling. If you are in a high radon area, consider contacting a contractor to conduct a radon test and install radon mitigation systems before sealing your home. Find out more at EPA's Consumer Guide to Radon Reduction. If you have an appliance that uses oil or gas, consider hiring a Home Performance Contractor to test those appliances to ensure they are properly drafting combustion gasses before and after sealing your home. Sealing in some cases can cause naturally venting combustion appliances to back-draft gases back into your home, creating unsafe conditions. 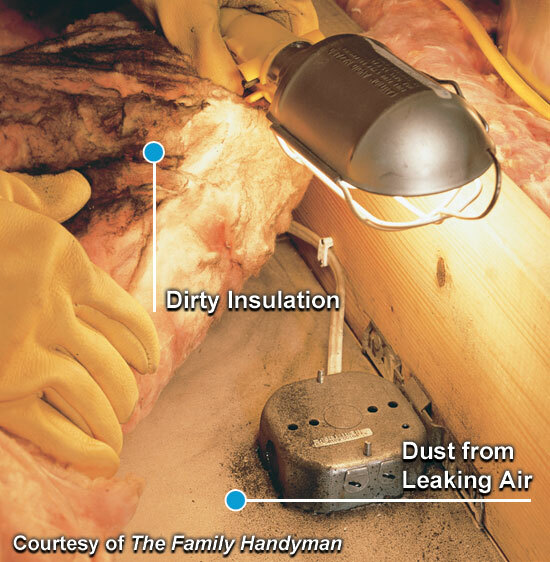 Sealing your home may trap indoor air pollutants. To address this may require additional mechanical ventilation to maintain safe air quality in your home. For more information on safe ventilation methods, visit EPA's Indoor Air Quality for Homes pages and DOE's Guide to Home Ventilation pages. This sketch will serve as a reference point once you get into the attic and will help you locate areas of air leakage. Note dropped soffits over kitchen cabinets or bath vanities, slanted ceilings over stairways, areas where walls (interior and exterior) meet the ceiling, and any other dropped-ceiling areas. 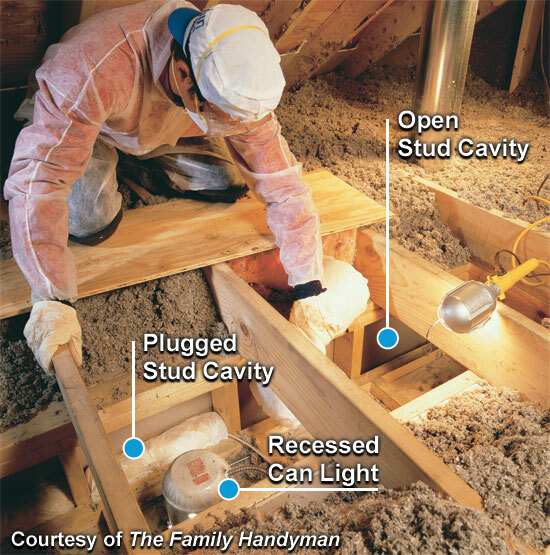 These areas may have open stud cavities leading directly into the attic and can be huge sources of air leaks. 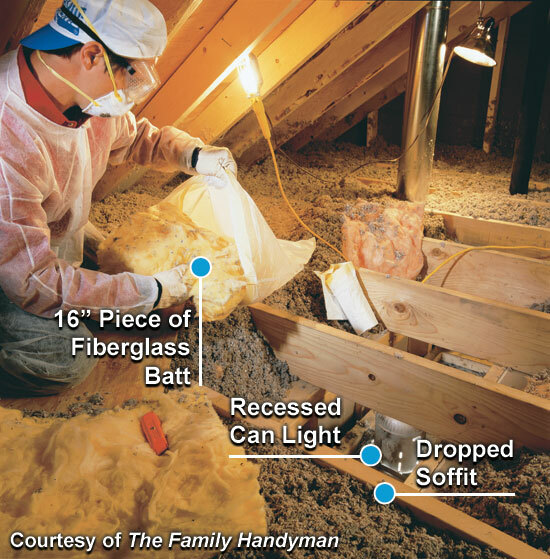 Look for common locations of attic air leaks. Plug the big holes first. Don't worry about finding and sealing all the little holes in your attic; your biggest savings will come from plugging the large ones. Once in the attic, refer to your sketch to locate the areas where leakage is likely to be greatest: where walls (inner and outer) meet the attic floor, dropped soffits (dropped-ceiling areas), and behind or under attic kneewalls. Step 1. Create stuffed bags. Cut a 16-inch-long piece from a batt of unfaced fiberglass insulation and fold it into the bottom of a 13-gallon plastic garbage bag. Step 2. Plug open stud cavities. Fold the bag and stuff it into the open stud cavity. Add more insulation to the bag if it doesn't fit tightly. Plug all open stud spaces, and then cover the soffit. Step 3. Cover dropped soffits. 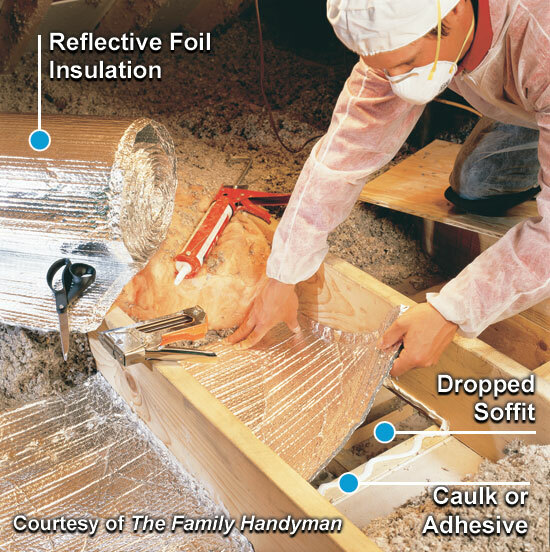 After removing insulation from a dropped soffit, cut a length of reflective foil or other blocking material (rigid foam board works well) a few inches longer than the opening to be covered. Apply a bead of caulk or adhesive around the opening. Seal the foil to the frame with the caulk or adhesive and staple or nail it in place, if needed. If you have a finished attic, seal behind the kneewalls. Finished rooms built into attics often have open cavities in the floor framing under the sidewalls or kneewalls. Even though insulation may be piled against or stuffed into these spaces, they can still leak air. Again, look for signs of dirty insulation to indicate air is moving through. You need to plug these cavities in order to stop air from traveling under the floor of the finished space. Step 4. Seal behind kneewalls. Cut a 24-inch-long piece from a batt of fiberglass insulation and place it at the bottom of a 13-gallon plastic garbage bag. Fold the bag over and stuff it into the open joist space under the wall (a piece of rigid foam board sealed with spray foam also works well for covering open joist cavities). Again, cover with insulation when you're done. The opening around a furnace or water heater flue or chimney can be a major source of warm air moving into the attic. Because the pipe gets hot, building codes usually require 1 inch of clearance from metal flues (2 inches from masonry chimneys) to any combustible material, including insulation. These gaps should be sealed with lightweight aluminum flashing and special high-temperature (heat-resistant) caulk. Before you push the insulation back into place, build a metal dam to keep it away from the pipe. Use the same technique for masonry chimneys. Caution: Furnace flues (the pipe that removes your furnace exhaust) can be very hot. Step 5. Cut aluminum flashing. Cut aluminum flashing to fit around the flue. For round flues, cut half circles out of two pieces so they overlap about 3 inches in the middle. Press the flashing metal into a bead of high-temperature caulk and staple or nail it into place. If there's no wood, staple or nail it directly to the drywall, but be sure not to staple or nail through the drywall. Step 6. Seal with silicone caulk. 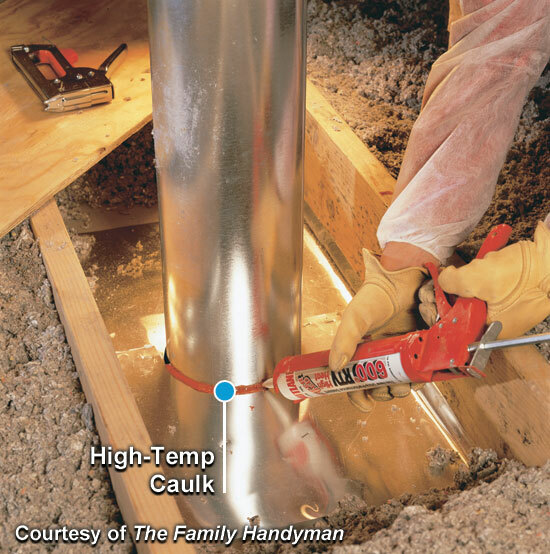 Seal the gap between the flue and metal flashing with special high-temperature caulk. Do not use spray foam. Even though most of the gaps spilling warm air into your attic are buried under insulation, you might be able to find evidence of them. Look for areas where the insulation is darkened. This is the result of filtering dusty air from the house. In cold weather, you may see frosty areas in the insulation caused by warm, moist air condensing and then freezing as it meets the cold air in the attic. In warmer weather, you might find water staining in these same areas. Although the insulation is dirty, it is still okay to use. There is no need to remove and replace it. After sealing the areas, just push the insulation back into place. If you have blown insulation, a small rake can be helpful to level it back into place. 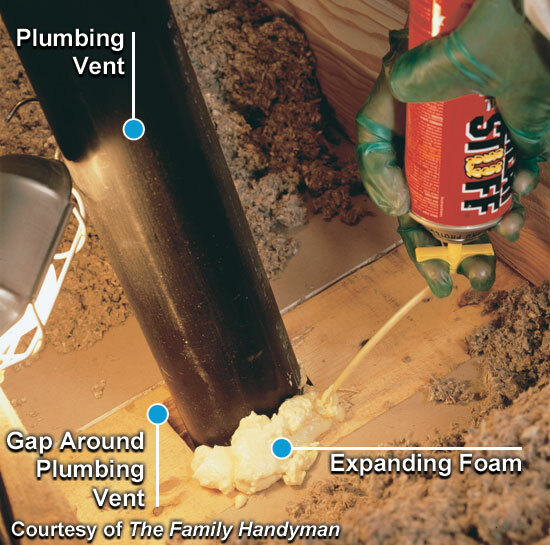 Use expanding foam or caulk to seal the openings around plumbing vent pipes and electrical wires. Be sure to wear gloves and be careful not to get expanding foam on your clothes, as the foam is very sticky and can be hard to remove once it sets. When the foam or caulk is dry, cover the area again with insulation. Step 7. Form an insulation dam. 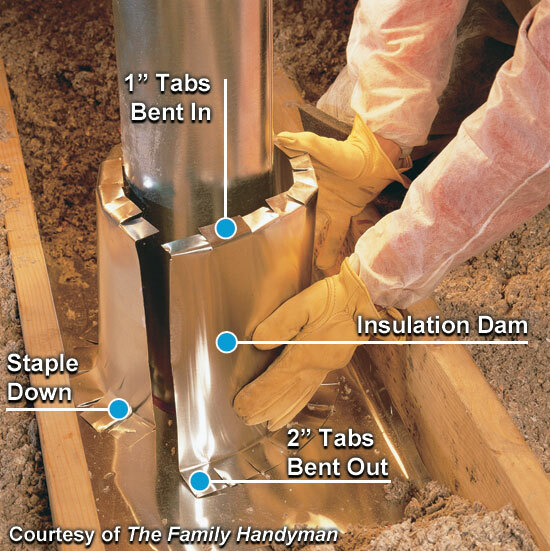 Form an insulation dam to prevent insulation from contacting the flue pipe. 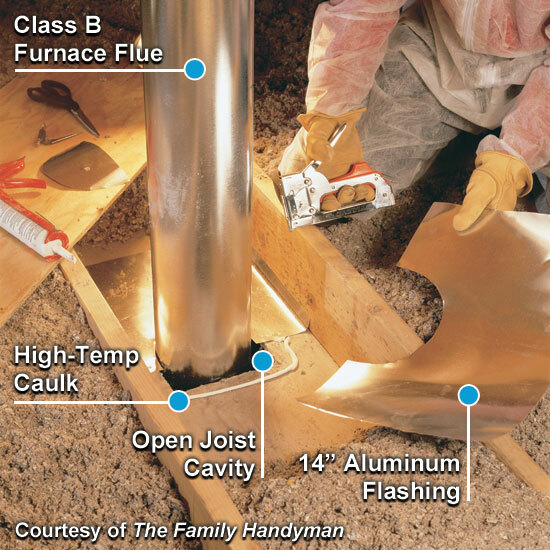 Cut enough aluminum from the coil to wrap around the flue plus 6 inches. Cut slots 1 inch deep and a few inches apart along the top, and bend the tabs in. Cut slots about 2 inches deep along the bottom and bend out the tabs. Wrap the dam around the flue and secure the bottom by stapling through the tabs. Now put insulation back right up against the dam. Step 8. Find attic bypasses. 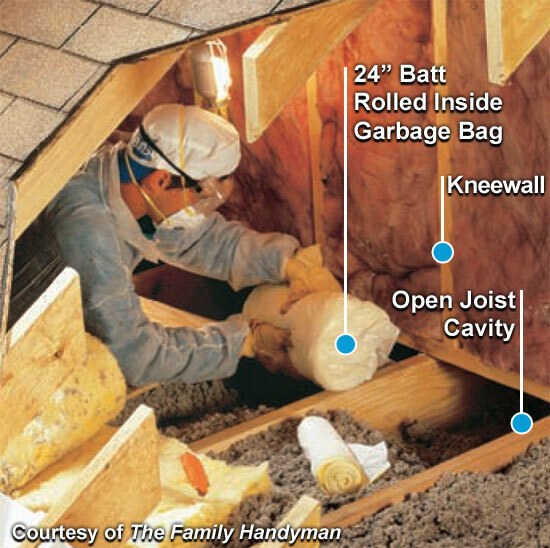 Check for gaps in your attic that facilitate air movement by checking for dirty insulation. Seal the gaps with caulk or expanding foam. 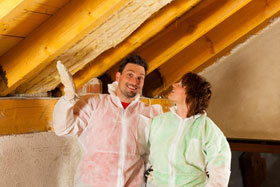 When complete and dry, push the insulation back into place. Step 9. Fill holes with caulk. Fill wiring and plumbing holes with expanding foam. 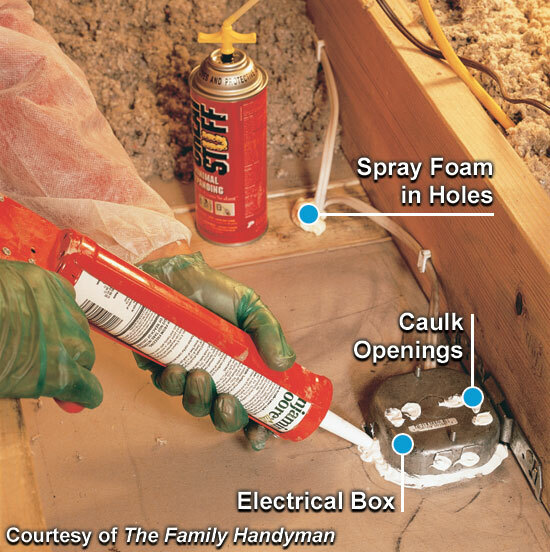 Caulk around electrical junction boxes, and fill holes in boxes with caulk. Step 10. Stuff gaps with insulation. If the space around your plumbing pipe is wider than 3 inches, you may need to stuff some fiberglass insulation into the space to serve as a backer for the expanding foam. Once the fiberglass insulation is in place, follow the directions on the can to foam the space around the pipe.